My hubby’s birthday was this weekend (May 11th) and he turned the big 3-0–he’s still in denial. Since it was his big day I let him decide what he wanted for his birthday dinner, and dessert. 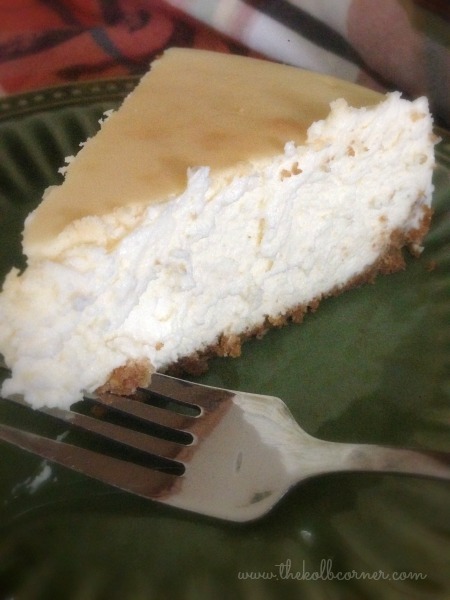 I figured he’d say steaks and a homemade apple pie, but he surprised me by requesting Italian Beef–easy peasy–and a homemade Cheesecake, not the No-bake kind–uh oh. 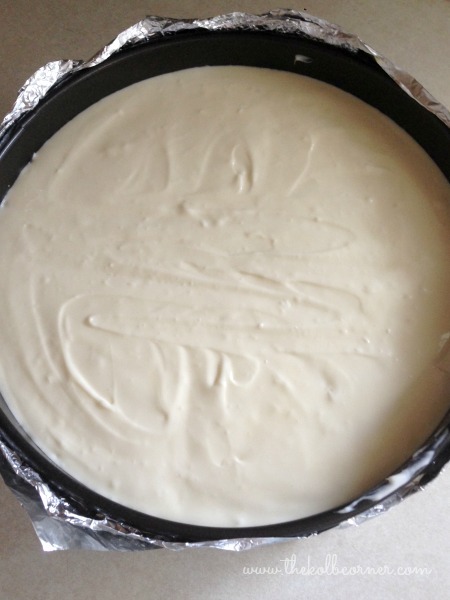 I have made one other cheesecake in my life, and while my family raved about it, I was less than impressed. There was no intense, rich flavor, it browned and bubbled on the top AND it cracked down the middle. BUT since I LOVE my husband, I went in search of some cheesecake baking tips and, of course, the perfect recipe. 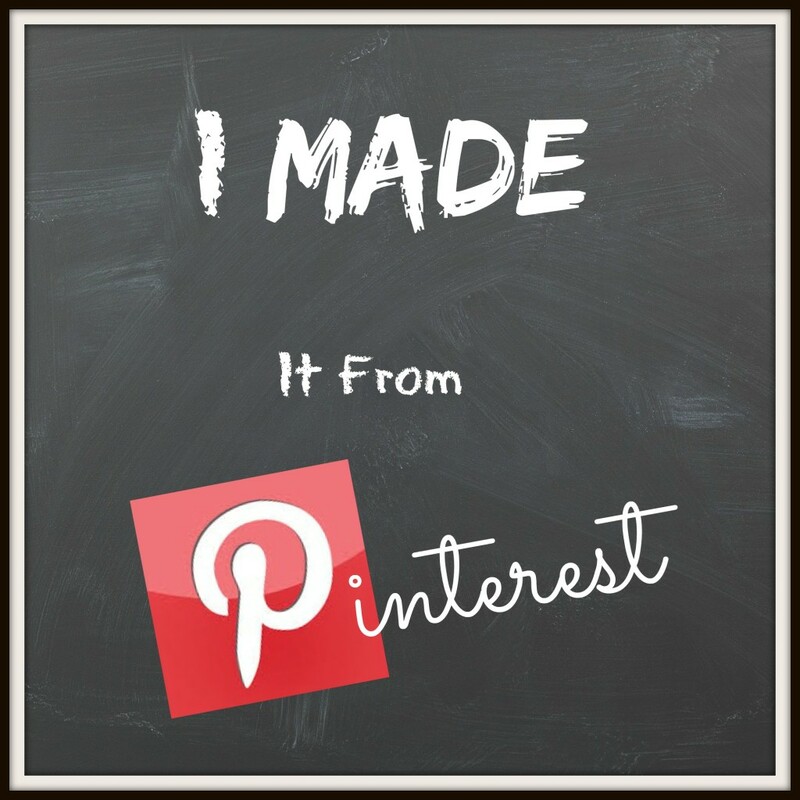 I have to say, this was the hardest Pinterest search I’ve had thus far. You’d think cheesecake would be a very popular search for Pinterest, but nope–everyone’s cheesecake had some sort of fancy schmancy twist to it. I just wanted PLAIN cheesecake–none of that chocolate, raspberry, pumpkin crap. After some time I finally found the one–and it just so happens to have perfect in the name! 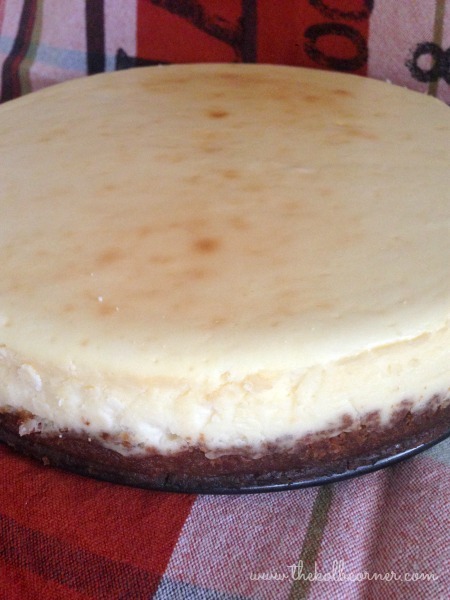 Not only was this a great recipe, but she also includes some tips on baking cheesecakes, such as using a water bath, and not mixing too much once you add in the eggs. 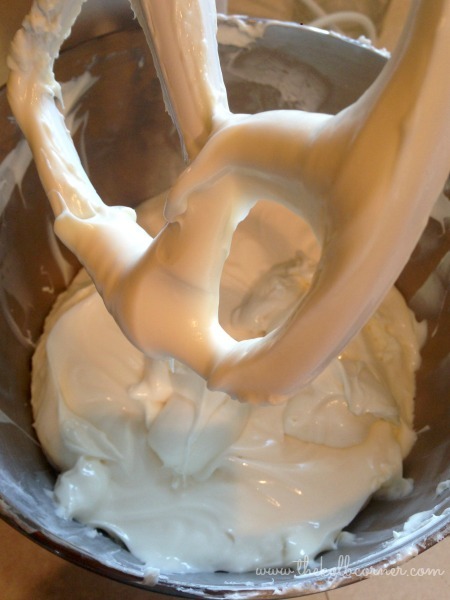 I couldn’t believe the majority of recipes I came across called for 5 bars of cream cheese! Nothing light about a homemade cheesecake I guess. One of the most important tips I learned from this site is that you want to make sure the cream cheese is totally at room temperature. If it’s still cold, it doesn’t whip up well and you end up with chunks. So after I let my 5 bars sit out for about 3 hours I knew they were ready. While the cream cheese was warming up, I made my graham cracker crust. Instead of using ready made crumbs, I took some whole graham crackers–about 1 sleeve–and crushed them with a rolling pin. Then I mixed in the sugar and melted butter and spread it out in a thin layer in my already greased pan. I baked it for about 12 minutes. Next time I think I will use vanilla wafers–that just sounds yummy to me! While my crust cooled I got started on the filling. 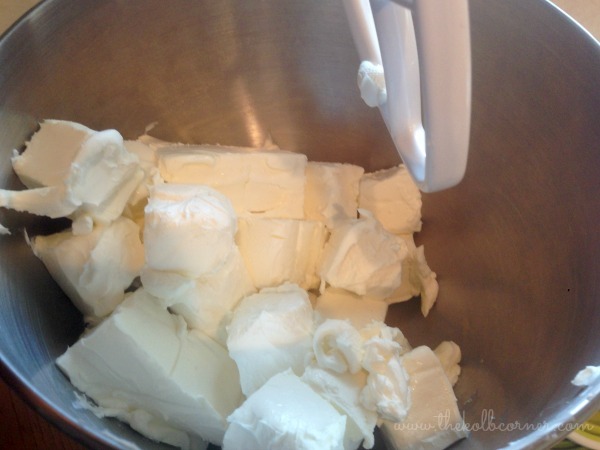 I started by cubing up all 5 bars of the cream cheese and threw it in my kitchen aid mixer. I made sure to really whip it up until it was creamy. I followed the rest of the recipe to a “T” and made sure not to over beat the mixture after adding my eggs. I couldn’t help myself, I had to taste the filling to make sure it was worthy. Of course it was! Nothing quite like 5 bars of cream cheese, 4 eggs and some sugar–healthy right? 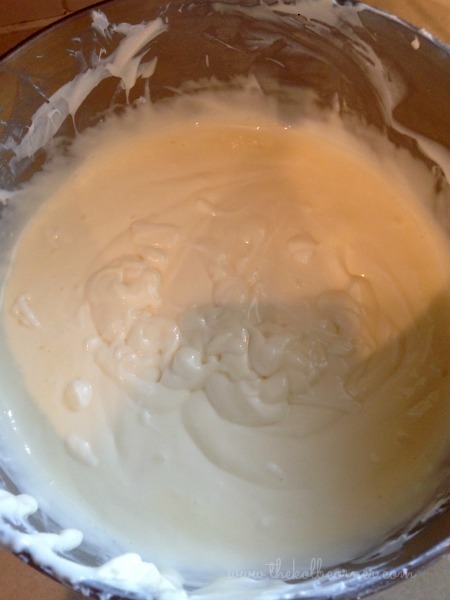 Next I poured the batter into my pan and smoothed it out on top. I also made sure to tap the pan against the counter to get rid of any air bubbles that may end up cracking the cake once it’s baked. I wrapped the pan with foil to make sure that once it was put in the water bath, no water would seep through the spring form pan. After the pan was ready I put it in a roasting pan with the rack in it and stuck that in the stove. I used my teapot to boil water to then pour into the roasting pan until there was water 1 inch past the bottom of the spring form pan. The water bath is supposed to help prevent cracking once the it has baked. I let the cheesecake bake for 1 hour 30 minutes instead of 1 hour 45 minutes. There was still a slight jiggle in the middle when I shut off the oven. I let the cheesecake cool with the oven door slightly ajar for 15 minutes. Then I “rimmed” the pan with a knife so the sides of the cheesecake would release from the pan and help prevent it from cracking as well. I let it cool for another 15 minutes before removing it completely from the oven. After it was out of the oven and out of the water bath, I let the pan cool on the counter and come to room temperature before I removed it from the spring form pan. 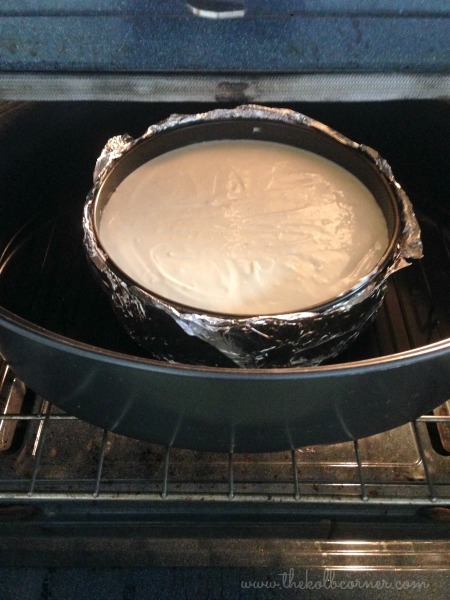 I was so scared when I unhooked the latch that my beautiful cheesecake would fall apart–but it didn’t! It was so beautiful, it almost brought a tear to my eye! I stuck it in the fridge to chill for about 6 hours before serving–it would be even better if it was able to chill over night, but since I didn’t have that kind of time 6 hours was plenty. Perfect New York style cheesecake! I went ahead and sliced the entire thing and froze the slices individually. I have to say, it’s even better when you eat it still slightly frozen in the middle. Either way though, this is, hands down, the best cheesecake I have ever had!